I was reading this post over at Mademoiselle Robot yesterday and it got me thinking. When was the last time I tried something outside of my sartorial comfort zone? I have been lucky enough to find clothes I love, that (hopefully!) flatter my ever-changing figure but I haven't been very experimental with my clothes recently and I made an effort to remedy this with my outfit yesterday. Yes, I am wearing harem trousers! Something I swore I would never do! I got them at Miss Selfridge for a bargainacious price and I thought that I would take the opportunity to try something new and the response on Twitter wwas overwhelmingly positive so I decided to keep them! I wore them out to a meal at Zizzis with my friends and my boyfriend. It was yummy as always and it was a lot cheaper than normal as we had vouchers...YAY! Of course I had to have the 'Torta Amaretti' which is my favourite pudding EVER. I wore them with my Lady Gaga t-shirt and my omnipresent nudey blazer. I like to think that I managed to make this style my own by incorporating some feminine details so the look wasn't entirely foreign! My flower corsage and bright pinky-coral lipstick glammed it up a bit! Me and Mark! I always thought that harems were supposed to be man-repelling but he hasn't scarpered yet! ;) What do you guys think of them? Yay or Nay? Have you tried anything new recently? What trends/clothes would you NEVER wear? P.S. Don't forget to enter our 50 followers giveaway HERE. We will be announcing the winner on Friday! I think they look pretty cool on you. i bought a pair last year and couldn't pull them off at all. Oh and Zizzi's is like my favourite restaurant!! So good to challenge yourself, they look great on you! Sherin- Thank you! I'm not really a "cool" person but I wanted to try it and I htink it worked! They were certainly comfortable and roomy enough for all that food at Zizzis! :) I can email you the vouchers if you want? English Rose- Thank you! I just wanted to try something different...yay for experimentation! Definitely a yay! 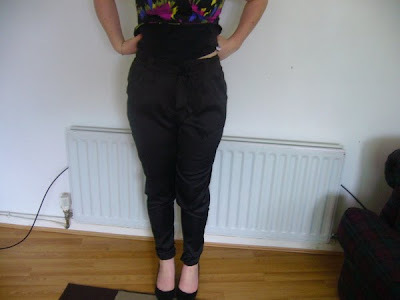 I adore this outfit and you look fabulous dear :D Those harem pants fit you perfectly. A trend I would never wear? Right now it's a maxi dress because that one I tried on was all kinds of awful! I'm generally pretty experimental when it comes to my clothes. I like mixing things up. I guess my biggest push recently has been the jumpsuit, I haven't regretted it though, so comfy! Lil- you look fab in your jumpsuit and I would say that new hair is an obvious experiment, and a very successful one!